Being a first time mom, the thought of being separated from my newborn daughter, Ava, was incredibly stressing. During the first weeks after her birth, my husband and I kept her crib in our room for convenience, but understood that we would eventually have to move her into her nursery. That’s why we decided to invest into a baby monitor. Not only did it help ease our worry, but gave us the ability to have more sleep at night. With so many baby monitoring solutions available, companies are constantly improving a parents ability to monitor their baby. Angelcare has done just that with their new AC1200 Video Movement & Sound Monitor for Smartphone. The award-winning company’s new baby monitor allows parents to “check in” on their baby from wherever they are in the world via their smartphone with the new Angelcare app. With this new device parents can turn their Smartphone (iPhone or Android), tablet, iPad or even their computer into a monitor to watch their little bundle of joy. The Angelcare AC1200 comes with an Under-the-Mattress Movement Sensor Pad, one of the most popular features of Angelcare baby monitors. It’s truly the ultimate feature to ease the mind of a parent. The sensor pad is equipped with baby movement detectors and will sound an alarm if your baby stops moving for more than 20 seconds. The installation is easy and designed with the upmost safety in mind. I really enjoyed the sleek design of the baby monitor. It’s not too bulky and features a soothing blue nursery light. The light really comes in handy for a clumsy mommy like me! I seem to always fall over a toy or something when I walk into her room late at night! The attached camera is also adjustable and I found it easy to get a perfect view of my daughter while being able to keep the monitor out of her reach. Seeing your baby in the dark is also possible as the camera streams in HD. One feature that really stood out to me is the 2-way talk-back that allows parents to communicate with their baby. This can be done from anywhere. So, if you need to run out of the house when your child is sleeping (obviously with someone home) you have the ability to soothe him/her back to sleep with your own voice. It’s also possible to activate a variety of lullabies at the same time. All the features are adjustable through the secure password-protected app that can accommodate up to 4 simultaneous users at a time. To provide parents with greater privacy and control, each user has an individual connection and needs parent consent to stay connected. • Internal Communication via Wireless Access Point – No Internet connection required at home. • Facebook or email login – You can choose to log in using your Facebook or Angelcare account for easy access. • Adjustable Movement Pad Sensitivity – Allows you to select your desired movement sensitivity level. The Angelcare AC1200 monitor retails for $299 and is amiable at Buy Buy Baby. The price point is comparable to other monitors of this quality and I feel that the investment is worth it. My daughter is turning three in July and we still use her monitor in case she calls us when we are watching TV or not close enough to hear her. 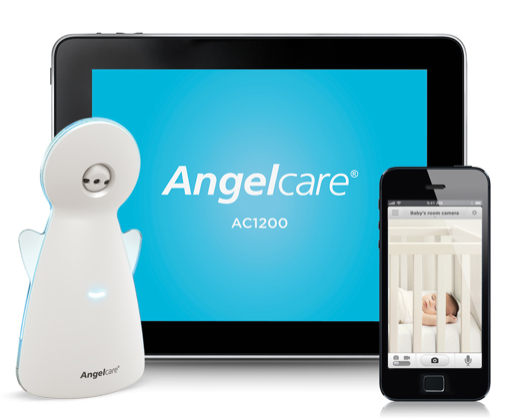 Visit Angelcare lean more about their other baby monitors. Disclaimer: Celeb Baby Laundry has not received any payment as a result of this review. I received the product in order to facilitate this review. All opinions are our own.